While at a discount store one day, I spotted an interesting tall lighthouse. It had a tiny solar panel and an equally tiny LED light. The LED was pointing downward, at the center of a rotating light reflector. I thought it might be turned into an interesting addition to my wife’s garden. cell and a small DC to DC converter to drive the small LED. I removed the small solar panel and glued in its place a 10 cell 5v 160ma solar panel. I unsoldered the small LED and in its place soldered a much more powerful LED, with the center facing outward. This would align the LED light with the center of the reflector. The reflector would produce two flashes of light for each rotation. cells. A 1N5817 schottky diode between the battery and the solar panel prevented current from leaking back into the solar panel from the battery at night. 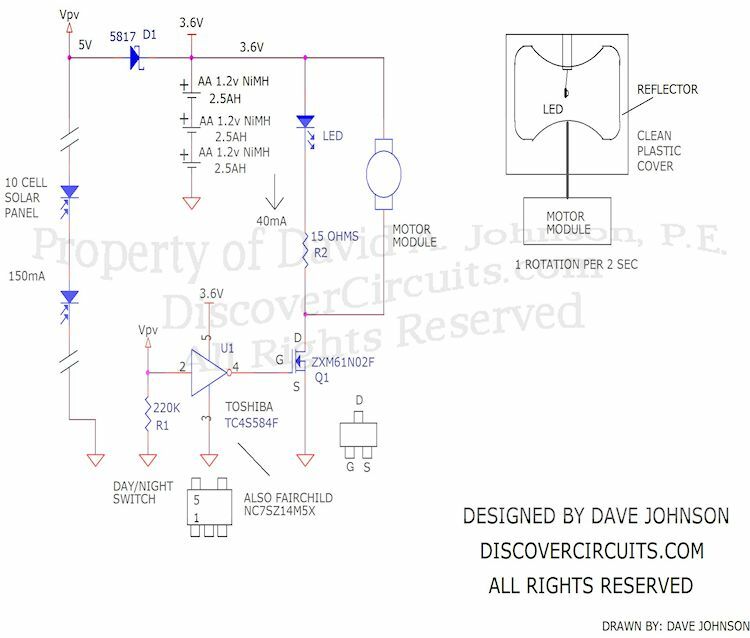 I used a single Schmitt trigger inverter to monitor the voltage across the solar panel and switch on an n-channel FET at night to turn on the LED and the reflector motor. I have a short video of the completed lighthouse in action below.